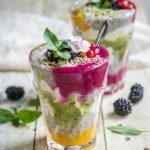 This layered chia pudding with mixed fruit puree is the perfect all natural, and healthy recipe to make you feel your best! Serve them up for breakfast or a fruity dessert! 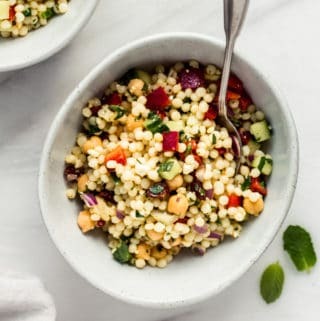 I think it’s no secret if you’ve stumbled upon this blog that you would find some recipes that include chia seeds. I mean the blog is called choosing chia after all! 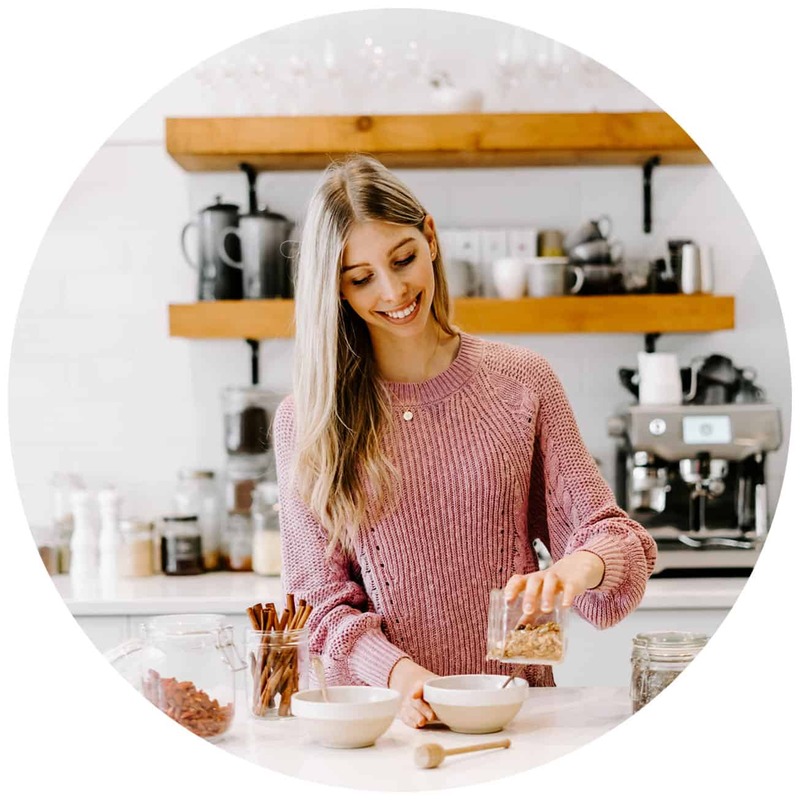 While the meaning behind the blog name is the idea of choosing a healthy lifestyle, I do love chia seeds and creating recipes highlighting the super food ingredient. I love incorporating chia seeds into smoothies, drinks, and recipes. And of course one of my favourite ways to eat chia is as a chia seed pudding. There are several very convincing reasons to incorporate chia seed pudding into your life. 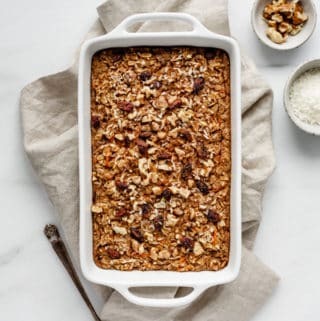 First, it is so easy to “make” – honestly you just combine a handful of ingredients let it sit for anywhere from 1 hour to 2 days. 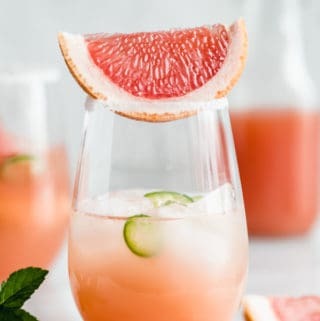 Second chia seeds and other common ingredients found in these recipes are so healthy. Chia seeds are high in omega-3 fatty acids, which most people are lacking and help reduce inflammation (so you need these) and they are high in fibre and protein! Third (but definitely not the last), there are so many varieties of chia seed pudding – anything from fruit, vanilla, chocolate, matcha; you can enjoy this all day long! This recipe for layered chia pudding with mixed fruit puree uses raspberry, kiwi, and mango puree for a mix of vibrant flavours. I love the combination of these three fruits together, for flavour that really pops! Not only do these flavours complement each other, they pack a nutrient punch. 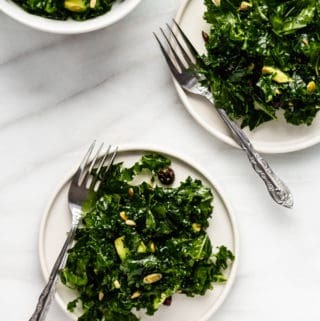 These 3 fruits will provide you with vitamins A, B complex, C and folic acid – what else could you need? For this recipe you simply need to prepare a simple vanilla chia pudding. I do recommend only adding the fruit purees once you are ready to eat the pudding. 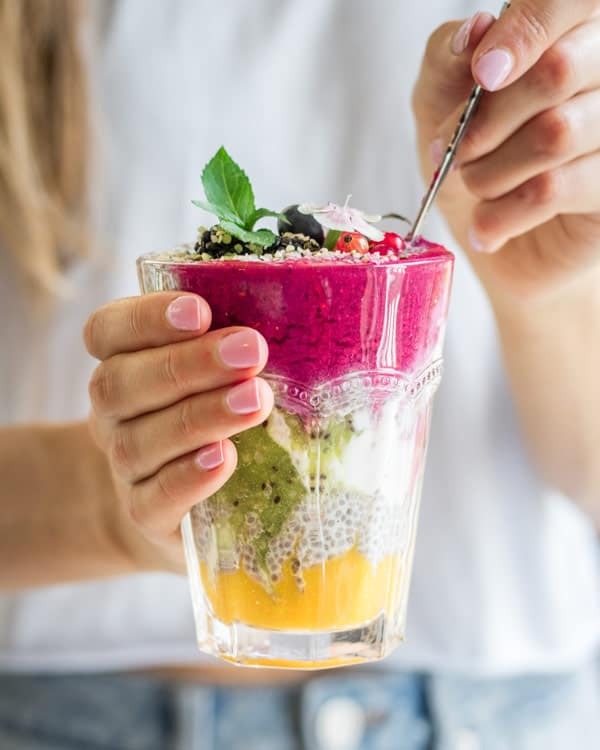 So once your chia pudding is to your thickness liking, puree the 3 fruit (one at a time so, you can create the beautiful array of colors) and transfer the mixtures – puree, chia pudding, puree, chia pudding – into a separate glass. Now you can enjoy! 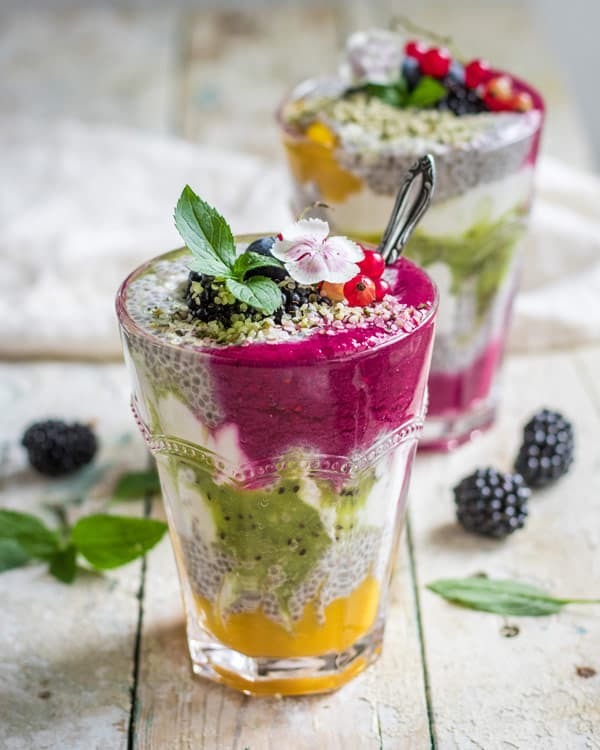 Enjoy this beautiful and nutritious layered chia pudding for breakfast or as a snack! Mix the chia seeds, almond milk, vanilla extract, and maple syrup together in a bowl. Whisk for 1-2 minutes until the mixture begins to thicken. Place in the fridge and allow to thicken up for 1 hour. Place the kiwis in a blender and blend until smooth. Remove and repeat with the mango and raspberries. 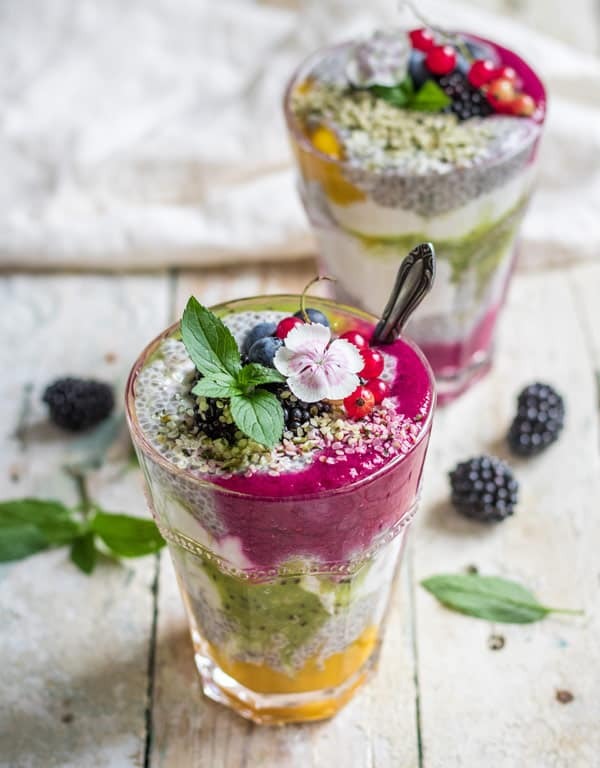 Once the chia pudding is thick, begin layering the chia pudding, fruit purees, and yogurt in a glass. Start with some fruit puree on the bottom, followed by some chia pudding, followed by some yogurt. Repeat this process until you have filled your glass. Garnish with hemp hearts and fresh fruit if desired. I saw this on Food Gawker and thought to myself “now if that isn’t just the prettiest thing”. I love all of the colors, and all of those delicious fresh flavors coming together! What a beautiful breakfast. Thank you so much! It really is a great breakfast or dessert. Packed with flavour too! This has GOT to be one of the most colorful deserts I have ever seen. And believe me… mine eyes is well versed in deserts. Beautiful! Thanks so much Ben I appreciate it! It tastes delicious too!